Now that you have your learning outcomes, you're ready to determine what major topics students need to learn in order to achieve them. These are known as modules. 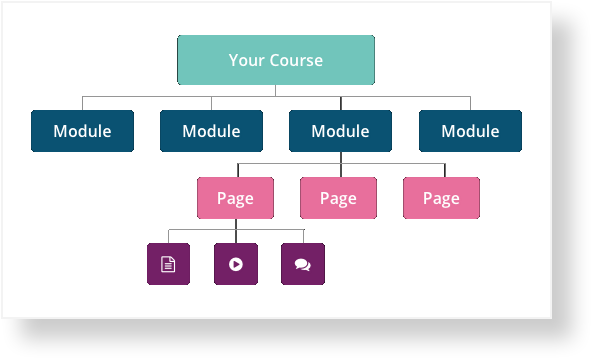 Modules provide the overall structure within your course. Module 1: What is Sustainable Thinking? Within each module are the content, resources and activities that will help students understand your subject. Content, resources and activities in OpenLearning are added to pages within each module. The sequencing of your modules is also important for students to not only build their topic knowledge in a logical and appropriate flow, but also for capturing your students' interest. For example, getting students to understand and practice sustainable thinking challenges in the first module, will enable them to apply that mindset to different living areas throughout the course. We recommend your first module to be a Getting Started module - with your homepage, course outline and any preliminary info students need for your course. Thereafter, sequence your modules in a way that makes sense for your topic and that will also make your subject interesting to your learners (what is an interesting hook for students to get excited about your subject?). Capture their interest early!